The total body water or fluid contributes to about 55-75% of the entire body weight. This exceptionally high percentage is enough to suggest how important water is for our survival. Adequate water supply can help you in reducing body weight along with several other health benefits. In fact, based on a recent study, you can lose up to 10 pounds of body weight each year if you drink 1 gallon of water a day. Is Drinking a Gallon of Water a Day Alright? Yes, it’s all right to drink a gallon of water gradually in a day. Human body has distinct requirements that are unique to every individual. In other words, every individual should consume fluids according to their activity status and body requirements. Based on clinical data, an average male requires 13 cups of fluid each day and an average females require at least 9 cups per day in order to maintain steady metabolism. If you have a dynamic lifestyle, you may require more than the suggested intake. The suggested intakes may also vary depending on the climate, overall health and certain physiological situations (such as pregnancy). There is no harm in taking more than the suggested amount. Drinking more water can help a great deal in reducing body weight in two ways: firstly, suppress the hunger so your stomach is constantly full with fluid and you feel less hunger; secondly, your body allows the releasing of retained fluids from cells while digestion and it happens when your body has enough water. 1. 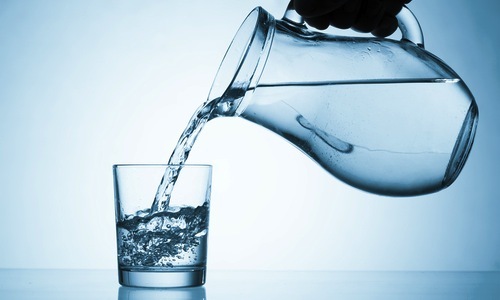 As soon as you wake up, drink 2 glasses (16 ounces) of water to flush out the waste in your body. 2. Before starting your breakfast, have a glass of water. It will keep you hydrated even at the start of the day. 3. In between breakfast and lunch, drink 3 glasses of water. You can have more if you do exercise during this period. 4. While you are having lunch, drink 2 glasses of water with it to avoid a heavy meal. 5. In between lunch and dinner, drink 3 glasses of water. You can add a sliced lemon in order to give a refreshing touch. 6. Complete the dinner with 2 more water glasses. By the end of dinner, you must have drunk a gallon of water. The effect of drinking a gallon before evening improves the effectiveness on the body and prevents midnight restroom trips which may affect the quality of your sleep. Only drinking water cannot reduce your weight unless you do exercise regularly and have a proper diet. We lose weight only when we cut down calories. A high intake of sugar and fat doesn’t aid in weight loss even if you are drinking a gallon of water a day. Do aerobic exercises as they help in burning calories and stored depots of fat. Eat healthy food instead of fatty and oily food. Drinking too much water that your kidneys cannot flush out in the limited time can cause hyponatremia in which sodium level of body are significantly reduced. Kidneys have the ability to excrete up to 1 liter (0.26 gallons) in an hour. Hyponatremia may cause intoxication or even brain swelling or death in severe cases. The benefits of hydration are not restricted to weight loss alone. In fact adequate water intake can improve your body in several ways. The percentage of water in our body is 60%, excessively higher than any other substance. Drinking more water helps the processes of absorption, temperature adjustment and digestion. Water enables the delivery of oxygen and nutrients to the brain via efficient circulation and circulatory pressure. Improved cognitive performance can be obtained if you increase the water intake to 8-10 glasses a day. Drinking water while exercising can help in maintaining a steady supply of energy to your muscles. Without proper hydration, your muscle electrolytes may shrivel, leading to poor performance and fatigue. Seven to ten ounces of water are recommended by American Council while exercising (20-minute session). Drinking less water can cause pain in your joints because they need fluid to stay strong and move flexibly. More water intake can make them smooth and pain-free. Drinking a gallon of water a day improves our skin. It works as a moisturizer to bring you puffy skin with fairer complexion. Avoid fluids that are rich in caffeine or alcohol to prevent skin dehydration. Research shows that the pain of migraine patients can be reduced by 21 hours over 2 weeks by increasing their daily water intake. Therefore it is advised to drink water before taking painkillers when you experience headache. Water serves as a solvent and allows the kidneys to flush out toxins and irritants from the body. If you are experiencing a darkening or excessive yellowing of urine with strong smell, increase your water intake. Water also prevents our kidneys from the development of stones. Drinking adequate amount of water prevents against certain cancers, including malignancies of bladder, breast and colon. Your immune system strengthens when you drink more water. Water helps in fighting against flu, arthritis, intestinal issues and rheumatism. Heart needs less energy to pump blood into the organs when your body has enough water. Researches also show that those who drink more water get less heart problems. For regular bowel movements, your body needs a good amount of water. Otherwise, the colons are forced to extract water from bowels that may cause constipation.